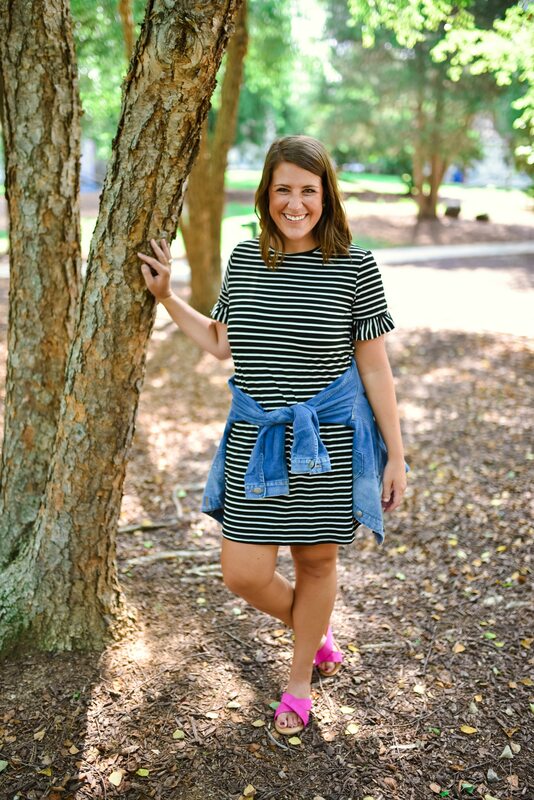 I have worn this T-shirt dress several times this summer, but it is the perfect piece to transition into fall. It is super affordable and feels like you’re wearing pajamas. These earrings are some of my favorites! They come in tons of colors, are handmade, and are so light. Adding the jean jacket is giving me total 90s vibes. I think it’s so cute, but perfect for fall, where it’s warm during the day and chilly when the sun goes down. I’m wearing each outfit with sandals, but this dress could easily be paired with booties and a sweater. We were super fortunate that tropical storm Florence did not affect us. There are many who were not so fortunate. There are many families on the North Carolina coast who need help and one of the kids in our neighborhood decided to start a fundraiser to do just that. She designed shirts and is going to buy necessary supplies with all proceeds and deliver them herself. If you want to help, please consider checking out the link below and buying one of her t shirts! You can find them here.